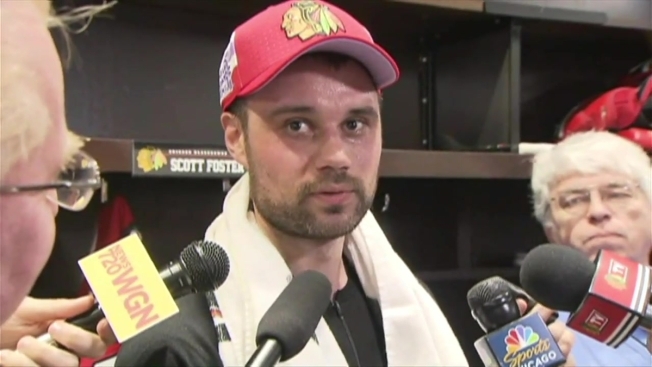 Scott Foster speaks after stopping seven shots as the Blackhawks' emergency goalie on Thursday night. Former Chicago Blackhawks goaltender Scott Foster got the thrill of his life when he played for the team Thursday night, but he didn’t exactly get rich in doing it. In fact, he didn’t get paid at all. Foster, who was forced to come into the team’s game against the Winnipeg Jets after Collin Delia went down with an injury, made seven saves on seven shots, but after signing an Amateur Try-Out Agreement, he didn’t get paid a dime for his services in the game. That’s because Foster had never played in a professional hockey game prior to Thursday night. His highest level of hockey experience was at the collegiate level, when he played for Western Michigan University, and as a result the Blackhawks didn’t have to pay him for the game, according to the Collective Bargaining Agreement. If Foster had played previously, he would have been paid $500 for his services in the game, and he would have been allowed to keep his jersey, according to Exhibit 17-A of the league’s CBA.